NEW SERVICE - Hire out our tents for a special occasion. If you have the space then we'll pitch our tents! Are you looking for something a little bit different? 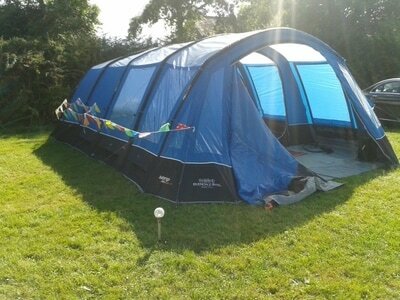 If you would like a tent pitched in you garden for a sleepover or a party then as long as you have an area bigger than 10 m x 6 m we can pitch for you. Our Sleepover/ party tents can accommodate up to 8 people and are provided for a minimum hire charge of 3 nights. We pitch the tents for you and set up all the extras. 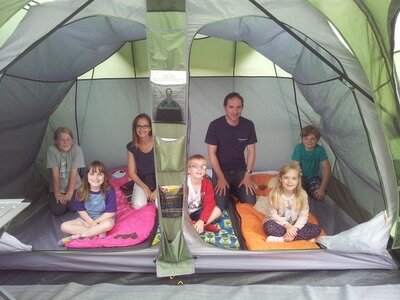 We can provide all the sleeping equipment you might need, mats, sleeping bags, pillows and lanterns. We'll even pack it all away again at the end. Each tent comes with indoor fairy lights, bunting & outside solar lights. Terms and conditions: Tents to be vacated ready by 11am on the day of dismantling. In our busy periods we may not be able to get to you by 11am but we will let you know. There is a 50.00 refundable damage deposit to cover any excess cleaning or minor wear due to usage. Any major damage or staining will incur a further charge.